Considering the successive iterations of the fence surrounding the London 2012 Olympic site in Stratford, east London, I demonstrate that during the five periods of enclosure considered, these boundaries have highlighted the London Games’ contested past, present, and future. An examination of the material and discursive constructions of each of these boundaries shows the Janus-faced nature of their relationship to the wider ‘mega-event’. I conclude that though the purpose of such enclosures may initially seem obvious, in actuality they, as parts of a wider assemblage, can act unpredictably both to support and challenge the Olympic brand and its existence in this part of east London. In the computer-generated visions of the 2012 Olympic Park in Stratford (east London) created prior to the Games, something crucial was missing: any sign of its vast security infrastructure – no cameras, no police, and no fences of any kind.1 The Games’ construction was overseen by the Olympic Delivery Authority (ODA) who were careful to present a particular view of the project, one that relied upon an uncontested representational denial of certain elements and reinforcement of symbols of officially sanctioned entertainment, order, and corporate sponsorship (Marrero-Guillamón 2012: 134). The crowd in these images do not throw bottles, no missiles lurk upon neighbouring flats, and the police snipers on the roof of the Holiday Inn are absent. In this paper I consider one material element of this ‘missing’ infrastructure: the fences that surrounded the Park. In identifying five archaeological phases of the Park’s enclosure, I attempt to document each period’s material-discursive constructions and ask: how did the fences’ presences and absences manifest an official ideological justification for the event and, at the same time, how did they act to contest this ideology? Creswell (1996: 9) argues that ‘[…] value and meaning are not inherent in any space or place […] they must be created, reproduced and defended from heresy.’ Only in their transgression are such ‘normative geographies’, based upon ideological formations, exposed; these geographies inform power relations (Cresswell 1996: 8–10). Ideology is here taken to mean how human agents consider certain ideas about the world to be normative and thus adapt their relations with other agents, who may have their own different and contrasting assumptions (Eagleton 1991: 6–8). The existence of an Olympic fence is informed by such ideological positions; it was built in support of a particular interpretative structure (e.g. a need to be ‘safe and secure’), yet this original ideology can be materially and/or discursively challenged (graffiting the fence for example) as a result of a different ideological belief. Relatedly, aesthetic responses to a thing can act as a means of naturalising or challenging the ideological position it is based around (Eagleton 1988: 330, 337). Particularly in its more sensory definition, aesthetics allows an unpacking of the discourses that produce a particular ‘idea’ of the Olympic site; for example, as an ahistorical, ‘safe and secure’, utopian ‘Park’, as opposed to a heterogeneous, historical, and contested agglomeration of smaller locales (Moshenska 2010: 610). The Park is experienced differently by individuals who relate to its materiality in varied ways: a former employee of a business demolished for the Olympic Stadium might look in the contours of the site for a recognisable trace of his employment, whilst a tourist standing in the same place might perceive a banal concrete esplanade that barely registers consciously. Accordingly, the tangible and intangible constructions of the boundaries and fences themselves are not the product of some abstract social ‘system’, but part of a continually changing network of relations between things, humans, and systems of knowledge (Latour 2005: 11) in which human agents are not considered to have greater agency than other parts of an assemblage. I study the materiality of the Olympic fences not just to make clear the complexity of these relations, but also to reveal how the ‘things’ in this network can be influenced by and influence discourse. Another example of such a relationship is how the Olympic Park’s network of pre-existing river channels influenced the security planning for the event. These landscape features led to the siting of the main stadium on an inter-river area described as an ‘island site’ (Gilmore 2011: 28–29) using water in lieu of internal fencing (Wainwright 2011). The rivers as agents are implicated in the Games’ security discourse, its organisers using them as a ‘natural’ resource, much like people in the Neolithic constructed enclosures incorporating natural features (Edmonds 1999: 87). Yet these waters are also unpredictable, and in addition to their barrier-like quality, have the ability to disrupt the Park and its inhabitants through flooding or as a means of access for individuals blocked by the land-based fences. Clearly such material-discursive relations are extensive; the water was also seen aesthetically as a means of beautifying the park in a discourse of the ‘greenest games ever’, yet it simultaneously carried chemical pollution unleashed by the construction works and thus must be managed using complex engineering and administrative structures to remain ‘clean’ (Marchant et al. 2013). With these example relationships in mind, I now move on to how the Park’s boundaries relate to the event as a whole. In this paper, the 2012 Olympics are considered as a ‘mega-event’: an event that is unusually large-scale, international, culturally ubiquitous, and with a ‘dramatic character’ (Roche 2000: 1–2). Sporting mega-events are mediated to global audiences of hundreds of millions (Hamilton 2012) and are highly politicised, often used to increase the visibility of a nation-state’s ‘brand’ as well providing opportunities for those who criticise or oppose said nation-states to express their dissatisfaction (Gold & Gold 2005: 140). However we must remember that though the ‘circus’ of such events moves around the world, we cannot ignore the existing local conditions they are ‘laminated’ onto (Coaffee et al. 2011). Taking Olympic security as an example, the Beijing Games (2008) were held against a background of intolerance to protest, and thus radically differed from Barcelona (1992), a democracy with on-going sub-nationalist tensions (Fussey et al. 2011: 48–49). These events are never apolitical and are grounded in tension between the idealised global event and the local conditions of their host site, hence both their simultaneous appeal and ability to spark controversy. All mega-events have some form of bounded-enclosure as a crowd-control and security measure, but I contend that the Olympic barriers have multiple, complex functions. Laura McAtackney (2011) has demonstrated how Belfast’s ‘peace walls’ can operate as agents beyond their purported necessity to prevent conflict in Northern Ireland, instead actualising segregation and continued conflict through their very presence. London 2012’s walls similarly operate at a variety of contested levels, both for and against the mega-event, as I will demonstrate below. Whilst accounts of London 2012’s security apparatus are invaluable for deconstructing the discourses of ‘safety and security’ surrounding the event (for example, Coaffee et al. 2011), they rarely consider the ideological and aesthetic impacts of the material presence of the fences and of their absence after removal. The lack of academic focus on their materiality serves to obscure questions about the nature of the project and the way barriers operate more generally (McAtackney 2011: 81). Klassen (2012) has demonstrated how the official performance of the Vancouver 2010 Winter Olympics was challenged by artists, who drew attention to the suspension of everyday ‘normality’ and the contradictions between the official rhetoric of inclusivity versus the extreme security measures in the city. I seek to emulate such an approach to explore the contested nature of the 2012 Park and how its enclosures both challenge and support the Games project. Understandably, given the events of 7/7/2005 and previous Olympic terrorist attacks, a rhetoric of threat and risk management permeates much of the discourse surrounding 2012’s organisation; thus I also seek to deconstruct the relationship between this and the materialisation of the fences (Graham 2012; MacDonald & Hunter 2013). This research is based upon site visits to the Park’s perimeter from 2011 onwards in a photographic survey, following a model similar to contemporary archaeology projects like Schofield and Cocroft’s (2011) study of Cold War remnants in Berlin. The enclosures are considered with reference to archival documents and my own experience of excavating within the Olympic Park for several months in 2007–8. The archaeological periodisation of the fences five phases I identify reiterates the continuous changes of the 2012 project. Due to length restrictions, this paper focuses most extensively on the first three phases. Phase one considers the ‘prehistory’ of barriers, both anthropogenic and ‘natural’, that characterised the land that became the Olympic Park prior to July 2007. Phase two concerns the installation and existence of a blue wooden hoarding around the Park during initial construction by the ODA in July 2007, most often called ‘the blue fence’. Phase three considers the steel Olympic Perimeter Fence (OPF), installed as a security measure to protect the final stages of construction from late 2009 onwards until the end of the Games in September 2012. Phase four is the present phase of the Park and covers the continuing presence and dismantling of the OPF, while phase five considers the future boundaries of the Park. In all of the phases, several overlapping themes emerge based on the presence or absence of enclosures, with absence considered an equally valid ‘material phenomenon’ as presence (Moshenska 2012: 124). In particular, I consider the location and accessibility of the fences rather like pre-historians have for sites with obvious boundaries in Britain and Europe (for example, Edmonds 1999). Who gets inside or stays outside? What areas were enclosed and why? Similarly, the fences’ temporality/lifespans must be related to their material existence. Why do some parts of the fences linger? How are they modified or changed? With this in mind I now turn to the ‘prehistory’ of the Olympic Park. The area that is now the Olympic Park once accommodated industry, housing, churches, allotments, and rail depots, amongst many other things. To the ODA it seems to have been considered a tabula rasa, though very little of it lay empty (Davis 2009; 2012: 190). By calling this ‘prehistory’, I too risk rendering the area devoid of any significance prior to the mega-event. This is not my intention: I deem the term appropriate given that the area was rapidly and irrevocably altered with the phase two ‘blue fence’ enclosure. I will now examine the pre-existing divisions and boundaries characterising the area before the erection of the blue fence in 2007 to determine how these influenced later enclosures. Stratford (fig. 1) is located in the Lower Lea Valley, a longstanding area of agriculture and industry from the early medieval period onwards. This was part of London’ pre-modern hinterland; the Lea provided transport for commodities and acted as a boundary between the old counties of Middlesex and Essex (Glennie 1988: 14). In the parish of West Ham and its environs (the site of the Olympic Park), the river was divided into channels, which became known as the ‘Bow Back Rivers’, in an attempt to drain parts of Hackney Marsh, beginning in the 9th century AD (Powell 1973: 57). The boundaries of the Olympic Park (following the line of the OPF). 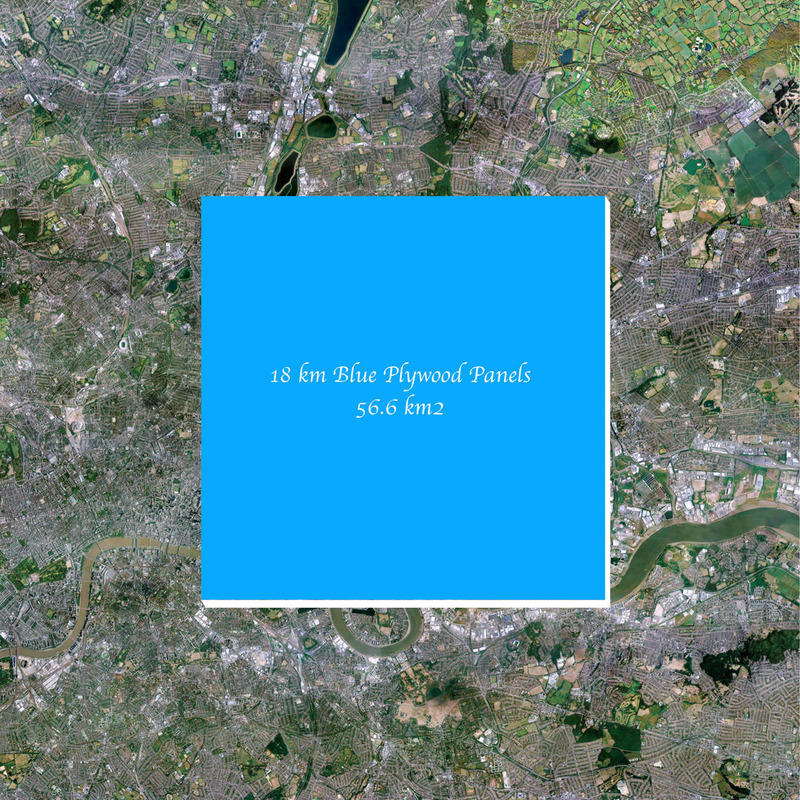 Google Earth, with author’s overlay. © Copyright 2013 Google Inc., Image © Copyright 2013 Bluesky. From the 18th century onwards, east London was one of Britain’s largest industrial areas; with the Industrial Revolution, businesses in West Ham benefited from cheap coal conveyed by river-barges and, by the mid-19th century, the railways (Clifford 2008: 133; Marriott 1987: 130–140). Huge rail yards emerged with the establishment of the Eastern Counties Railway works in the 1840s, and the North London line built in 1854, still cuts through the middle of the Park as the London Overground (Lewis 1999: 108–112). This area also housed many noxious industries such as chemical manufacturers, which have left contamination by heavy metals, asbestos, and hydrocarbons. This toxic legacy was revealed with the Olympic reshaping of the land. One of the most obvious features of the site today is the Northern Outfall Sewer embankment running along the south-western edge of the area completed in 1863, to carry waste from north London to Abbey Mills Pumping Station (Upson et al. 2012: 157–158; fig. 2). This embankment is now topped by a public path known as ‘The Greenway’, built by Newham Council in the 1980s (Cherry 2009: 26), and has acted as a useful fixed viewpoint over the transformations in the area. Pipes of the Northern Outfall Sewer cross the Lea Navigation. Photograph: J. Gardner. The north of the area has been enclosed by the A12 dual-carriageway (East Cross Route; fig. 3) since 1973 (TMA n.d.); to the south and east, the train tracks to Cambridgeshire and Essex form another boundary. More recently the area has been split north and south by the buried Stratford International Station ‘box’ in the centre of the now-Olympic Park completed in 2007, though under construction since before the Olympic bid was won (HS1 2013). Another major element of infrastructure that divided the area were over fifty electricity pylons (with power-lines buried during 2007 in advance of the Olympics). These were significant local landmarks, snaking north-south across the site (Davies 2012; Murphy n.d.). This iconic dual line of cables features heavily in both official regeneration literature and art projects conducted prior to the Olympic changes (for example, Campkin 2012). The A12 Crosses the Lea from Hackney Wick. Photograph: J. Gardner. Overall, the Back Rivers, the railways, the Sewer/Greenway, pylons, and roads all served to spatially divide this area in the past. The landscape that was present prior to the Olympics was diverse and characterised by these features, forming a complex canton-like landscape of infrastructure, businesses, and leisure space (Davis 2009; 2012). Individually, most of these structures or spaces also had their own enclosures: fragments of an old chain-link fence lingers today where a tree has grown around it, just outside the OPF but also spattered with Olympic blue-fence paint (fig. 4). A palimpsest of fences: a chain-link fence is embedded in a tree spattered with Olympic blue fence paint, with the OPF in the background. Photograph by J. Gardner. This was the supposed empty land that the Olympics were to obliterate (Campkin 2012). The authorities saw these barriers as one of the main reasons the area required ‘regeneration’ (Owens 2012: 218–219). These pre-existing divisions paradoxically made the site attractive for development, yet also meant it could be easily secured for the Games. The old boundaries created the wrong kind of enclaves: allotments, scrap dealers, travellers’ camps; things that were undesirable to the new project but had flourished here precisely because of the land’s undesirability. Only with a budget of billions could this informal, disordered, and contaminated landscape be reordered to create a homogeneous ‘sportspace’ (Edensor et al. 2008: 290). Such huge resources, along with the nebulous ideological justification of ‘the public good’, meant legislative weapons like compulsory purchase orders could be deployed to remove the old places (for example, Hatcher 2012: 197–198), enforced materially by eviction notices, demolition crews, and, ultimately, fences. The fence is a literal barrier, but the largest border is the future park itself, which in its making, inevitably closes down route ways and forms a divide between the London boroughs that surround its edges. The fence was 3m tall, 18km (11.2 miles) long, nailed into posts set in concrete (Beckett 2007) with nearby trees and lamp posts ‘boxed-in’ to prevent climbing (Cornford 2008): a seemingly unremarkable structure and ostensibly just a legal requirement to protect passers-by from construction (H.M. Government 1980). Today it is almost completely gone. Only in places do fragments linger, surrounding infrastructure for the Park’s ‘legacy’ period, or forgotten under bridges (fig. 5). The fence used so much wood that if laid flat, it would have created a surface area of 56.6km2 (Andrich 2011). For so long this was the only physical sign of the London Olympics: ‘a vivid blue frontier’ (Sinclair 2008), all that could be seen from outside, other than mountains of demolition rubble. Its absence now is striking. A remnant of the blue fence in 2013 under the London Overground. Photograph: J. Gardner. Internally, the Park’s construction was divided into Planning Delivery Zones (PDZs), each overseen by many consultants and sub-contractors, with the North and South Park divided by checkpoints. Working inside was confusing as landmarks were demolished and new geographies emerged. The blue fence obscured this protean terrain and allowed the tumult that attacked the earth, rivers, and buildings of the area to be hidden from the outside. Unlike the OPF, this fence was opaque and there were no (official) viewing windows. The site was not yet ready to be seen; only a privileged few could see the whole thing from a viewing gallery atop the decaying Holden Point tower in Stratford (Richardson 2012: 69). Frequently, archaeological interpretations are made about the scopic power-relations that sites of ritual importance employ; the cursus at Stonehenge, for example, blocked a clear view of the rituals taking place to those outside (Pearson et al. 2006). The ODA similarly did not want people to see - this was vividly illustrated by the numerous arrests and harassment of photographers and others outside the barrier during its existence (for example, Sinclair 2009: 552; Marrero-Guillamón 2012). The overriding demand of the project was for it to be finished on time for the Games, but this and the argument for ‘safety’ would appear to belie an almost colonial ideology by the ODA. Not only were people removed and access restricted, but most were not even permitted to see how tax billions were being spent, except in carefully drip-fed press releases (for example, ODA 2007). This limitation facilitated a re-ordered landscape to emerge butterfly-like after seven years inside an unsightly pupa. This scopic-denial was no accident; the magic and thus legitimacy of the project would have arguably been challenged if all could have watched the demolition of allotments, homes or churches, or the long-buried contaminated soil being removed by contractors in protective suits. The fence not only protected the site and (supposedly) passers-by from its dust and machinery, but in its materiality it also enclosed a utopian vision whose existence and necessity, like some ancient ritual, was not to be questioned. (fig. 6). Many of these proclaimed ‘DEMOLISH. DIG. DESIGN.’: the battle-cry of the ODA’s campaign superimposed on a ‘constant procession of happy, hygienic images of the future’, in contrast to the toxic hills behind and twitchy security guards (Marrero-Guillamón & Powell 2012: 14). Promotional panels extant on the blue fence at Marshgate Lane. Photo: J. Gardner. The fence’s material presence and these official visions’ denial of the old places were strongly challenged by its relationships with artists, protesters and academics. Gesche Würfel’s photographs, for example, highlight the blue fence’s banal absurdity (fig. 7) yet capture its impermeability and impact on its surroundings (Knowles et al. 2009: 74–75). Jean-François Prost acquired a can of the blue ‘All Aboard’ paint left behind by teams of painters who kept the fence graffiti-free (Beckett 2007), and after getting it matched at a hardware store, painted a multitude of other blue objects. He then left these around the perimeter to question the fence’s existence, testing if maintenance teams would remove them (Powell 2009: 85; Prost n.d.; fig. 8). The Office for Subversive Architecture/Blueprint Magazine installed a viewing platform of six steps made from plywood and painted blue which went unnoticed by the authorities for 60 hours in June 2008 in protest at the invisibility of the site2, and innumerable graffiti artists temporarily modified the fence. Car Park 2 by Gesche Würfel. From Go for Gold! 2009 The Blue Fence, © Copyright Gesche Würfel 2009. Used with permission. From All Aboard by Jean-François Prost © Copyright Jean-François Prost and the Adaptive Actions Platform. Used with permission. See Prost n.d. for further details. Although these actions had little lasting effect on the work inside, they demonstrate anger about how this area was appropriated for the mega-event and the fact that people were generally kept in the dark about what was happening inside. This anger seems particularly poignant if we note that at the same time as these actions, local people were continually complaining about dust drifting out over the blue fence, despite the fact that radioactive soil (previously thought to be clean) was being excavated and spread around the site, thus exposing the fence’s ineffectiveness as a ‘health and safety’ measure (Cheyne 2008; Wells 2010). This episode brings us onto another important point about the barrier: control of access. Barriers such as this are not particularly effective at keeping people out - they can be climbed over easily (Cornford 2012). The agency of the fence was thus also manifested in its psychological impact of implementing force over the outside environment. For example, locals walked miles out of their way around it (Prost n.d.). Michalski (2007: 202, 209) notes that things like signs, fences, or emergency exits, as non-human agents ‘reach beyond and beneath intellectual cognition to secure the acquiescence of individuals.’ In other words, at a mostly unnoticed level these things influence our behaviour and help foster compliance to both their presence and the disciplinary regime on whose behalf they act. However, we should be wary of accepting this as a regulatory force imposing an ideology that we respect unquestioningly. The very fact I am writing this article shows that the fence was not only a barrier but also a site of critique. Furthermore, it simultaneously acted, for example, as an escape route for feral cats marooned in the Park (Hammond 2007), a place of work for fence-painters, and an abstract line on a map that planners idealised. These diverse agential relations with the fence demonstrate that although it did sometimes act as its creators intended, its relationship with other agents was much more nuanced. Within the Park, as we archaeologists moved around inside the blue fence, we would see internal zones fenced off with written warnings against access, usually due to high levels of contamination or Japanese Knotweed.3 These barriers, like those outside, also manifested a complexity of relations that generally seemed to go unnoticed at the time. Contamination was dealt with according to particular systems of knowledge which in turn influenced decisions and other agents. For example, I avoided certain areas inside even if they were not marked as contaminated (though mindful of the other parts of the assemblage: safety briefings, protective equipment) due to fear of particular chemicals (mercury, arsenic) and their ability to cause illness. Conversely, specialist workers sought out these places, probing the soil to earn wages and deploying diagnostic chemical tests strongly attracted to certain molecules and not others. Arguably, the organisers’ use of enclosure represents a physical and psychological need to counter a fear of the unknown, similar to my own (Fussey et al. 2012: 265). However, their fears were, in the main, not grounded in the spaces of the Olympic Park and its toxic subterranean ‘legacy’, but rather in the outside, a place of unquantifiable threats, given the local area’s deprivation and nearby high-profile terrorist cases (BBC News 2012). This need to secure the site was not only to protect those inside but the Olympic ‘brand’ itself (Fussey et al. 2012: 278). This came to an apogee with the third phase of the fence, to which I now turn. Following the dismantling of the blue fence beginning in late 2008, it was replaced with a high-security, welded-mesh barrier, called the Olympic Perimeter Fence (Batsworth 2008; fig. 9 and 10). This fence, mostly still extant at the time of writing (May 2013), is 5m high (including, in most areas, a 5000 volt 1.2m high electric-pulse topping) and roughly follows the 18km course of the blue fence (fig. 1). It is composed of welded-mesh panels attached to posts with 7m-high CCTV posts at regular intervals, equipped with cameras, infrared and high-power white lights, and is based upon Home Office-accredited designs (ODA 2008: 28). The fence was manufactured and installed by Zaun (DCMS 2012) and appears to be a model called ‘High-Sec® Super’, their most secure product (Zaun 2012: 20). The OPF’s watery manifestation at the confluence of the Lea and Lea Navigation. Photo: J. Gardner. Here I will consider the OPF’s existence during the period prior to and during the Olympic/Paralympic Games. The fence is implicated in wider discourses of security, threat, and inequality in its material presence and relationships with other parts of the Games’ assemblage. Its existence highlights a variety of interlinked and contested narratives based on a sense of ‘inside/outside’, accessibility, and permanence/impermanence. Significantly, it differs from the previous barrier in its semi-transparency and its resilience to subversion. This is also reflected in the Olympic Safety and Security Strategic Risk Assessment produced by the Home Office (2011: 2) to analyse five major threats to the Games: terrorism; serious and organised crime; domestic extremism; public disorder; and major accidents and natural events. In this document protest is considered a form of ‘public disorder’ and is connoted with ‘domestic extremism’ (2011: 5, ¶ 2). This assessment must be seen in relationship to widespread public belief in the prevalence of crime, despite consistently falling recorded crime levels (Shaw 2013), along with privatisation of formerly public space, and the rise of the private-security industry, which stands to profit from this (Minton 2012; Graham 2012b: 448). The OPF materialises an official need to keep the Park ‘secure’ and empty of all conceivable ‘threats’, both to the physical site and the 2012 brand (Houlihan & Giulianotti 2012: 703). The stance against protest must also be seen as a result of the ‘Host City Agreement’ that the 2012 organisers signed with the International Olympic Committee (IOC) and the UK’s acceptance of the Olympic Charter, which demands that the Games not be used for any kind of protest (IOC 2011: 91). Although relatively little protest took place prior to the Games,5 one notable example involved activists for victims of the Bosnian genocide. These activists chose to nominate the ‘ArcelorMittal Orbit’ tower in the Park as a ‘memorial-in-exile’ to the victims of ethnic cleansing at the site of an iron-ore mine in Omarska (Republic Sprska, Bosnia). Around 800 people were murdered at Omarska in 1992 with many buried in mass graves and over 1000 still missing (Schuppli 2012). ArcelorMittal bought the mine 12 years after the conflict and in building the Orbit, as an official 2012 sponsor, provided steel from every continent it operated in, including some made from Omarska ore, for the tower. ArcelorMittal has, after initially being sympathetic to the survivors and relatives, denied regular access to the Omarska site as a result of pressure from local Serbian ultra-nationalists, citing ‘safety concerns’ (quoted in Fabian 2012). Thus, the activists felt that the Orbit could act as a ‘memorial-in-exile’ to the victims of these crimes, given the steel’s tainted origin and their lack of access to the mine (Schuppli 2012). Unsurprisingly, given its need to placate sponsors and maintain its obligations to the IOC, the London Organising Committee for the Olympic Games (LOCOG) maintained a deafening silence on the Omarska issue when the memorial was nominated, as well as on their involvement with ArcelorMittal (who are also allegedly involved in controversial practices elsewhere (Moushumi 2010)). This situation would appear to contradict the universalistic and peaceful credo of Olympism (IOC 2011; Houlihan & Giulianotti 2012: 715); however, clear parallels can be seen with other Games. The myth of apolitical Olympism was exposed most recently with preparations for the 2014 Sochi Winter Games, where venues are being built on the site of genocide against Circassian ethnic minorities (No Sochi 2013). It is unfortunate that the Orbit, like the memorial at Omarska, is restricted and behind a high fence, also in the name of ‘safety’. Hopefully this situation will change when the Park re-opens. In relation to LOCOG’s silence, the OPF can be seen as a material embodiment of the monolithic façade of the Olympic project and its general attempts to stifle or ignore dissent to protect the brand. The belief that sport is apolitical and that the outside world must not affect the inside is both sustained by and necessitates the material existence of security fences, CCTV systems, and missile launchers (Milmo 2012; Cheyne 2013b). This is not to deny the necessity of security as there are obvious risks to such a high-profile event, particularly given the terrorist attack on the Israeli team at Munich 1972 and bombing at Atlanta 1996. However, Boyle and Haggerty (2009) argue that as mega-events have become ever more spectacular, their security measures have also become ever more spectacular, acting as a form of social regulation that makes people ‘feel secure’ through displays of force combined with well-calculated public relations (see also Price 2008: 2). The fence is not just a manifestation of the threat of terrorism and commensurate desire to prevent an attack, but is a material reinforcement of the importance of this threat’s existence in society; it is an attempt to strengthen a belief that the ‘ends justify the means’, and in its reassuring presence, encourages people to leave the motives and legitimacy of the state and, crucially, the reasons for this threat unquestioned. However, the other side of this is that the fence’s presence only reiterates the threat’s supposed gravity; we are therefore made worried just enough to submit to such measures by their mere existence. Such levels of security often serve to displace attacks outside to non-venues with less protection, as with Atlanta’s Centennial Park bombing by an individual with an extremist anti-abortion stance in 1996 (Fussey et al. 2011: 50). Many security measures are also necessary as a result of the host Olympic nation’s foreign policy (2011: 45): 2012’s preventative measures relating in large part to the UK’s policies and military action in the Middle East and Northern Ireland. A calculus of ‘lesser evil’ seems to have been employed by the 2012 Games’ security organisers (see Weizman 2011: 8–16). For example, placing Rapier missiles on the building rooftops near to the Park meant, theoretically, that hijacked planes could be shot down to avoid them hitting the venues. This deployment, as well as notionally acting as a deterrent to would-be terrorists, is also reliant on a calculation of acceptable collateral damage should the worst happen: i.e. the remnants of a plane hit by Rapiers would fall somewhere in the London area. Security officials deemed this acceptable, as the ‘lesser of two evils’ since fewer people would die (and by implication, less damage would be done to the Olympic brand) in such a crash than one at the main stadium (Corera 2012). It is outside the scope of this paper to address the full ethical questions around this, but I contend that the OPF, as part of a wider security assemblage, displaced threats outside the Park and was implicated in a value judgement about the difference in importance of people inside and outside of the Park. The fence as an agent in the assemblage of London 2012 also acted as a control on visibility: through its semi-transparency one could gaze at the festivities yet be barred from entering. If you were inside, it was the ultimate limit for the Games spectacle, a reminder of the outside world and the abnormality of the inside. Sorkin (1992: 209–211) highlights how such places allow an officially sanctioned ‘fun’ that is inherently conservative; an illusion of freedom that only allows a certain level of release. This utopia is a mirage, a supposed improvement on the outside that is actually a hall of mirrors (Sorkin 1992: 26; Mitchell 1992: 299). This is not to deny its reality (mirrors are, after all, ‘real’ things); however, just like the outside, the spectacle is based upon mundane assemblages: sewers, bureaucrats, electricity cables, and low-wage employees. I contend that the OPF’s presence generally went unnoticed during the Games. Paradoxically, the organisers wanted the focus to be on the inside, yet outside, prior to the event, police and security forces hassled photographers who wanted to look through it (for example, Laurent 2012; Marrero-Guillamón 2012). During the Games, even this limited vision was blocked with most adjacent paths sealed off (fig. 11). The Lea Navigation towpath sealed off during the Games, August 2012. Photograph: J. Gardner. Although a Foucaultian architecture of panopticism clearly existed at the Olympics, this incredible organised spectacle arguably performed a similar role to the ‘exhibitionary complex’ in its display of state power through organising and controlling an assemblage of people, things, and knowledge on a vast scale. The fence, as part of this ordering assemblage, not only bounds the spectacle but is asked to reinforce a self-regulation that demands the ideology of the utopia be taken at face-value, without questioning the historicity of the place and who is situated outside the fence. The OPF, despite its initially obvious purpose of ‘safety and security’, was clearly a fulcrum for many different discourses around the project, and though partly acting in the service of power, also exposes the limits of that power in its versatility as a marker of protest and dissent that has repercussions beyond Stratford. As I now turn to the end of its life, it becomes apparent that this fence’s materiality was just the most obvious part of a wider act of enclosure performed by the London 2012 project, and that this bounding will linger long past its physical dismantling. Currently the OPF is being disassembled: the electric current for the fence was turned off in October 2012 (Cheyne 2013a), its wires are being removed (fig. 12), and in places the whole fence has been cut down (fig. 13). In these places, temporary fencing has sprung up, with vicious-looking ‘Ultra-Barb Razor Wire’ preventing entry to the construction site (fig. 14). Many (though not all) of the CCTV cameras and lights have also been cut down, suggesting ‘safety and security’ is no longer the main priority for the site but, once again, merely ‘health and safety’ (V. Stonebridge pers. comm. 8/1/2013). Questions remain over how much of the fence will be left behind, with some suggesting that even if mostly removed, its legacy may be another divided landscape (Houlihan & Giulianotti 2012). The removal of the OPF’s electric wires. Photograph: J. Gardner. The OPF is replaced by temporary fencing. Photograph: J. Gardner. ‘Ultra-Barb’ warning sign on the temporary fencing. Photograph: J. Gardner. Athens retained its cripplingly expensive Games surveillance system (Samatas 2007) and Sydney kept Games-time legislation criminalising protest and homelessness near the venues for years after the event (Toohey & Taylor 2012). The concern is that one of the OPF’s legacies will be the retention of London 2012’s even more aggressive security regime (Fussey et al. 2011: 32). For example, all of the Park’s (and fences’) cameras are linked to police control centres in Lambeth, Bow, and Hendon, suggesting London’s ‘newest park’ might also be kept under the most surveillance. This is part of an overall strategy for greater integration of surveillance in London, particularly in areas of high deprivation like Newham, Hackney, and Tower Hamlets (Fussey & Coaffee 2012: 88–89). Will the Games and legacy organisers’ commitment to sustainability include reusing its 900 cameras elsewhere? Given the East End’s infamy for crime and, more recently, suspected terrorists, Fussey et al. (2011: 68) speculate that developers in the Park will not be keen to build here without either incorporating such infrastructure or building new barriers and cameras to entice cautious would-be tenants. This is perhaps all the more important given recent memories of the 2011 August riots. Internal divisions will also remain in the form of rising bollards and ‘secure-by-design’ hard landscaping, with contractors being sought as long ago as 2007 for a ‘security legacy’ (ODA quoted in Coaffee et al. 2011: 3322). Additionally, the Park’s new housing runs the risk of acting as an unaffordable series of gated barriers in the middle of East London, much like the ‘regenerated’ Docklands (Gardner 2011: 22–23). Of the promised 11,000 new homes, it seems few will be affordable: the housing associations responsible for many of them will be permitted to charge rents of up to 80% of London market rates even for ‘social housing’ in one of the most deprived areas of the UK against a background of housing benefit cuts (Cheyne 2013c; Minton 2012; LPP 2011). A more positive element of the Park’s future will be the provision of new green spaces and access to the Back Rivers, which will be traversed by new bridges in many places. In the short term (while the Park lies undeveloped), once the fence is down, the area will be easier to traverse than before the Olympics, given its unified landscape and single ownership (OPLC 2012). The legacy project also aims to integrate the surrounding ‘fringe’ areas with new infrastructure (DFL 2013). Boris Johnson argues that such surrounding neighbourhoods ‘[…] cannot feel like they are on the edge, looking across at something new’: a laudable sentiment given the disconnections I discussed regarding the OPF (quoted in DFL 2013: 4). However, this positivity comes with caveats, as the post-Olympic Park (to be called the Queen Elizabeth Olympic Park) is to be privately managed and patrolled by Balfour Beatty contractors (LLDC 2012). One therefore wonders how ‘public’ this park really will be, and if, like nearby Stratford City, it will in effect be a ‘private-public’ space where activities such as rough sleeping, photography, and demonstrations are prohibited (Minton 2009: 31–32). The long-term future of the Park cannot be fully considered here; however two things are clear. As the Legacy Corporation is clearly aware, this new park and its eventual housing and businesses must be successfully integrated into an existing area, not only aesthetically but also in terms of creating genuine opportunities and accessibility to employment, housing, and public services (Tomlinson 2012). If this is to be a success, then several fences must come down including the OPF, along with less tangible barriers such as high rents, cuts to housing benefits and local services, and prejudices against low-income communities (Barnes 2012). Only then will this really be ‘everyone’s park’ (LLDC 2013). In this consideration of the enclosures of London 2012, I hope to have demonstrated that such barriers, like the project itself, are highly contested. Their ability as agents in the wider assemblage of a mega-project to both support and undermine it make clear that our relationship to fences and other boundaries is not as self-evident as we might think. With the Olympic fences we see a specialised attempt to deploy enclosure as a means of protecting brands: the idealised city, nation, sponsors, and Olympic movement itself. As both representatives and material enforcers of this discourse at London 2012, the fences at times did act on behalf of power and dominant ideology. Yet, the project organisers’ desire to protect 2012’s legitimacy was directly challenged by human action such as trespass, graffiti, and protest, as well as more indirectly by the material constructions the ODA themselves deployed. For example, the material presence of the OPF manifested (to some) an unnecessary and unwelcome intrusion onto the life of the city and exposed an uneasy link between Stratford and the foreign and domestic policies that are said to have necessitated its presence. The deployment of the blue fence as a ‘health and safety’ measure also exposed the complex nature of its agency; its material inability to control dust may sadly re-materialise in the bodies of local people in years to come. The prehistory of the site’s barriers was equally contested and complex: the beauty of its rivers was appreciated, yet their ability to carry pollution was not; its heterogeneous landscape was seen as limited and underdeveloped, yet allowed for a diversity and complexity of relationships in the local area that the post-Olympic Park may struggle to replicate. The five rings of the Park uniquely raise questions not only about the legitimacy of mega-events, and of the agency of boundaries, but also how enclosure as a wider phenomenon might be said to structure wider power relations between human and non-human, ideals and reality. 1See http://tinyurl.com/2012CGIs for CGI images. 3A plant whose roots can destroy concrete building foundations and was the scourge of the Olympic Park. Andrich, A. (2011). The Future is Blue. AA School of Architecture Projects Review 2011 - Diploma 10, Available at: http://projectsreview2011.aaschool.ac.uk/submission/uploaded_files/DIP-10/anna.andrich-1.jpg [Accessed May 21, 2013]. Barnes, M. (2012). An army of benefit scroungers? The evidence just doesn’t stack up. The Guardian, Available at: http://www.guardian.co.uk/commentisfree/2012/nov/28/benefit-scroungers-child-poverty-parents [Accessed May 25, 2013]. Batsworth, C. (2008). New London Olympics site security fencing appears. Games Monitor, Available at: http://www.gamesmonitor.org.uk/node/696 [Accessed May 16, 2013]. Beckett, A. (2007). Cordon Blue. The Guardian, Available at: http://www.guardian.co.uk/society/2007/sep/21/communities [Accessed May 10, 2013]. Bennett, T. (1995). The Birth of the Museum: History, Theory, Politics. London, New York: Routledge. Boyle, P. and Haggerty, K.D. (2009). Spectacular Security: Mega-Events and the Security Complex. International Political Sociology 3(3): 257–274. Available at: http://onlinelibrary.wiley.com/doi/10.1111/j.1749-5687.2009.00075.x/abstract [Accessed March 4, 2013]. Campkin, B. (2012). Buried by Stephen Gill and Hackney Wick: an excavation In: Marrero-Guillamon, I. and Powell, H. eds. The Art of Dissent: Adventures in London’s Olympic State. London: Marshgate Press, pp. 112–123. Cherry, B. (2009). The Thames Gateway: An introduction to the historical landscapes of the northern riverside. Available at: http://www.english-heritage.org.uk/publications/thames-gateway-introduction-historical-landscapes-northern-riverside/ [Accessed May 10, 2013]. Cheyne, J. (2008). Hackney Wick residents complain about noise and dust from the Olympic Park. Games Monitor, Available at: http://www.gamesmonitor.org.uk/node/645 [Accessed May 11, 2013]. Cheyne, J. (2013a). How topping! Olympic Park fence electrified from mid 2010 to 22nd October 2012. Games Monitor. Games Monitor, Available at: http://www.gamesmonitor.org.uk/node/1988 [Accessed May 22, 2013]. Cheyne, J. (2013b). Leyton Marsh: Malice and the prosecution of Mike Wells. Games Monitor, Available at: http://gamesmonitor.org.uk/node/1999 [Accessed May 23, 2013]. Cheyne, J. (2013c). To the Manor born - 15% affordable housing in the Aftermath Zone?. Games Monitor, Available at: http://www.gamesmonitor.org.uk/node/2062 [Accessed May 22, 2013]. Clifford, J. (2008). The Urban Periphery and the Rural Fringe: West Ham’s Hybrid Landscape. Left History 13(1): 129–142. Coaffee, J., Fussey, P. and Moore, C. (2011). Laminated Security for London 2012 Enhancing Security Infrastructures to Defend Mega Sporting Events. Urban Studies 48(15): 3311–3327. Available at: http://usj.sagepub.com/content/48/15/3311 [Accessed April 17, 2013]. Comerford, P. (2012). The Olympic security fence is a modern day form of enclosure. opendemocracy.net, Available at: http://www.opendemocracy.net/ourkingdom/philip-comerford/olympic-security-fence-is-modern-day-form-of-enclosure [Accessed May 16, 2013]. Corera, G. (2012). The Olympic fear factor. BBC News, Available at: http://www.bbc.co.uk/news/magazine-18923741 [Accessed May 22, 2013]. Cornford, S. (2008). Thanks to the Fence Builders. Trespassing the Olympic Site, Available at: http://trespassingtheolympicsite.blogspot.co.uk/2008/10/thanks-to-fence-builders.html [Accessed May 11, 2013]. Cornford, S. (2012). Trespassing the Olympic Site In: Marrero-Guillamon, I. and Powell, H. eds. The Art of Dissent: Adventures in London’s Olympic State. London: Marshgate Press, pp. 35–39. Cresswell, T. (1996). In Place/Out of Place: Geography, Ideology, and Transgression. Minneapolis, MN: University of Minneapolis Press. Davies, S. (2012). Powering the Games. Energy and Technology Magazine, August 2012: 40–43. Davis, J. (2009). Inside the Blue Fence: An exploration. Researching the spatial and social life of the city: a collection of working papers by doctoral researchers in the LSE’s Cities Programme 1: 10–32. Davis, J. (2012). Through the Blue Fence to the Emerald City: From the Contested to the Envisioned Public Realm In: Marrero-Guillamón, I. and Powell, H. eds. The Art of Dissent: Adventures in London’s Olympic State. London: This Is Not A Gateway/Myrdle Court Press, pp. 188–196. Department for Culture Media and Sport. Department for Culture Media and Sport - First 2012 Cabinet meets at Olympic Park. Available at: http://www.culture.gov.uk/news/news_stories/8758.aspx [Accessed January 9, 2013]. Design For London. Stitching the Fringe: Working Around the Olympic Park. Available at: http://www.londonlegacy.co.uk/the-park/around-the-park/. Eagleton, T. (1991). Ideology: an Introduction. London and New York: Verso. Edensor, T., Christie, C. and Lloyd, B. (2008). Obliterating Informal Space: The London Olympics and the Lea Valley: A Photo Essay. Space and Culture 11(3): 285–293. Available at: http://sac.sagepub.com/content/11/3/285 [Accessed April 19, 2013]. Edmonds, M. (1999). Ancestral Geographies of the Neolithic: Landscapes, Monuments and Memory. London: Routledge. Fabian, L. (2012). Omarska, the ArcelorMittal Orbit, & Britain’s richest resident. Planet Ivy, Available at: http://planetivy.com/news/3096/the-curious-tale-of-omarska-concentration-camp-the-arcelormittal-orbit-britains-richest-resident/ [Accessed May 22, 2013]. Fussey, P. et al. (2011). Securing and Sustaining the Olympic City: Reconfiguring London for 2012 and Beyond. Farnham: Ashgate. Fussey, P. et al. (2012). The regeneration games: purity and security in the Olympic city. The British Journal of Sociology 63(2): 260–284. Available at: http://onlinelibrary.wiley.com/doi/10.1111/j.1468-4446.2012.01409.x/abstract [Accessed April 8, 2013]. Fussey, P. and Coaffee, J. (2012). Olympic rings of steel: Constructing security for 2012 and beyond In: Security Games: Surveillance and Control at Mega-Events. London and New York: Routledge, pp. 69–101. Gardner, J. (2011). Canines or Canaries? An Archaeology of the Isle of Dogs’ Contemporary Past. Unpublished MA Thesis. London: UCL. Available at: http://www.academia.edu/3529360/Canines_or_canaries_An_Archaeology_of_the_Isle_of_Dogs_contemporary_past._2011._UNREVISED_MA_Cultural_Heritage_Dissertation_ [Accessed May 24, 2013]. Gilmore, M. (2011). Countdown to the Olympics. The RUSI Journal 156(2): 28–34. Available at: http://www.tandfonline.com/doi/abs/10.1080/03071847.2011.576472 [Accessed April 8, 2013]. Glennie, P. (1988). In search of agrarian capitalism: manorial land markets and the acquisition of land in the Lea valley c. 1450 – c. 1560. Continuity and Change 3(01): 11–40. Gold, J. and Gold, M. (2005). Cities of Culture: Staging International Festivals and the Urban Agenda, 1851–2000. Aldershot and Burlington, VT: Ashgate. Graham, S. (2012). Olympic 2012 Security: Welcome to lockdown London. City 16(4): 446–451. H.M. Government. Highways Act 1980 (amended). Available at: http://www.legislation.gov.uk/ukpga/1980/66/section/172 [Accessed November 5, 2013]. Hamilton, M. (2012). Will 4 billion people watch the Olympic opening ceremony?. The Guardian, Available at: http://www.guardian.co.uk/media/blog/2012/jul/27/4-billion-olympic-opening-ceremony [Accessed April 26, 2013]. Hatcher, C. (2012). Forced Evictions: Legacies of Dislocation on the Clays Lane Estate In: Marrero-Guillamón, I. and Powell, H. eds. The Art of Dissent: Adventures in London’s Olympic State. London: This Is Not A Gateway/Myrdle Court Press, pp. 197–206. Home Office. London 2012 Olympic Safety and Security Strategic Risk Assessment (OSSSRA) and Risk Mitigation Process Summary Version 2. Available at: https://www.gov.uk/government/publications/london-2012-olympic-paralympic-safety-security-risk-assessment-summary-version-2-january-2011 [Accessed May 16, 2013]. Houlihan, B. and Giulianotti, R. (2012). Politics and the London 2012 Olympics: the (in)security Games. International Affairs 88(4): 701–717. HS1 Limited. About Stratford International. Available at: http://stratfordintl.co.uk/The-Station [Accessed April 29, 2013]. International Olympic Committee. Olympic Charter. Available at: http://www.olympic.org/Documents/olympic_charter_en.pdf [Accessed May 16, 2013]. Klassen, L. (2012). Participatory art at the Vancouver 2010 Cultural Olympiad. Public 23(45): 212–223. Knowles, C. et al. (2009). A line is there to be broken In: Naik, D. and Oldfield, T. eds. Critical Cities: Ideas, Knowledge and Agitation from Emerging Urbanists. London: This Is Not A Gateway/Myrdle Court Press, pp. 62–76. Latour, B. (2005). Reassembling the Social: An Introduction to Actor Network Theory. Oxford and New York: Oxford University Press. Laurent, O. (2012). Olympics’ security guards “trained to deter people from taking photographs”. British Journal of Photography, Available at: http://www.bjp-online.com/british-journal-of-photography/news/2169597/olympics-security-guards-trained-deter-people-taking-photographs/page/2 [Accessed May 23, 2013]. Lewis, J. (1999). London’s Lea Valley: Britain’s Best Kept Secret. Chichester: Phillimore. London Legacy Development Corporation. Estates and Facilities Management. londonlegacy.co.uk, Available at: http://www.londonlegacy.co.uk/investment-and-venues/venues-and-infrastructure/estates-and-facilities-management/ [Accessed May 22, 2013]. London’s Poverty Profile. Overview of London boroughs. London’s Poverty Profile, Available at: http://www.londonspovertyprofile.org.uk/key-facts/overview-of-london-boroughs/ [Accessed May 23, 2013]. MacDonald, M.N. and Hunter, D. (2013). The discourse of Olympic security: London 2012. Discourse & Society 24(1): 66–88. Available at: http://das.sagepub.com/content/24/1/66 [Accessed April 15, 2013]. Marchant, A.P. et al. (2013). The development of a GIS methodology to assess the potential for water resource contamination due to new development in the 2012 Olympic Park site, London. Computers & Geosciences 51: 206–215. Available at: http://www.sciencedirect.com/science/article/pii/S0098300412003159 [Accessed July 8, 2013]. Marrero-Guillamón, I. (2012). Photography against the Olympic spectacle. Visual Studies 27(2): 132–139. Available at: http://www.tandfonline.com/doi/abs/10.1080/1472586X.2012.677497 [Accessed April 19, 2013]. Marrero-Guillamón, I. and Powell, H. (2012). Introduction: Intervening in London 2012 In: Marrero-Guillamón, I. and Powell, H. eds. The Art of Dissent: Adventures in London’s Olympic State. London: Marshgate Press, pp. 8–17. Marriott, J. (1987). ‘West Ham: London’s Industrial Centre and Gateway to the World’ I: Industrialisation, 1840–1910. The London Journal 13(2): 121–142. McAtackney, L. (2011). Peace maintenance and political messages: The significance of walls during and after the Northern Irish “Troubles.”. Journal of Social Archaeology 11(1): 77–98. Available at: http://jsa.sagepub.com/content/11/1/77 [Accessed July 18, 2013]. Michalski, D. (2007). Employee Entrances and Emergency Exits: Exposing the Invisible Imagery of Consumption In: Marcus, A. and Neumann, D. eds. Visualizing the City. London and New York: Routledge, pp. 197–216. Milmo, C. (2012). Scotland Yard defends arrests of “Critical Mass” cyclists. The Independent, Available at: http://www.independent.co.uk/news/uk/crime/scotland-yard-defends-arrests-of-critical-mass-cyclists-7985727.html [Accessed May 23, 2013]. Minton, A. (2009). Ground Control: Fear and Happiness in the Twenty-First Century City. London and New York: Penguin. Minton, A. (2012). The London Olympics: a festival of private Britain. The Guardian, Available at: http://www.guardian.co.uk/commentisfree/2012/jan/24/london-olympics-festival-private-legacy [Accessed May 22, 2013]. Mitchell, T. (1992). Orientalism and the Exhibitionary Order In: Dirks, N. ed. Colonialism and Culture. Ann Arbor, MI: University of Michigan Press, pp. 289–318. Moshenska, G. (2010). Gas masks: material culture, memory, and the senses. Journal of the Royal Anthropological Institute 16(3): 609–628. Available at: http://onlinelibrary.wiley.com/doi/10.1111/j.1467-9655.2010.01642.x/abstract [Accessed January 25, 2013]. Moshenska, G. (2012). Unbuilt Heritage: Conceptualising Absences in the Historic Environment In: May, S., Orange, H. and Penrose, S. eds. The Good, the Bad and the Unbuilt: Handling the Heritage of the Recent Past. Oxford: Archaeopress, pp. 123–126. Murphy, (N.d.). Lower Lea Valley Cable Tunnels - Power Lines Undergrounding Project. Available at: http://www.murphygroup.co.uk/uploads/documents/Lower%20lea%20valley%20-%20page%20by%20page%20view.pdf [Accessed April 29, 2013]. BBC News. British extremists “main threat.”. BBC, Available at: http://www.bbc.co.uk/news/uk-england-london-18604593 [Accessed May 22, 2013]. No Sochi. 14 Reasons for Opposing Sochi 2014. Available at: http://www.nosochi2014.com/campaign/14-reasons-for-opposing-sochi-2014.php [Accessed July 8, 2013]. Olympic Delivery Authority. 08/90151/FULODA - (document 54) Planning, Design and Access Statement Planning Application for Outer Perimeter Fence. Available at: http://planning.london2012.com/upload/publicaccessODAlive/Reduced%20File%20Size%20D%20OPF%20Planning%20Statement%20(7969).pdf [Accessed May 16, 2013]. Olympic Delivery Authority. [ARCHIVED CONTENT] News: London 2012 finishes year on track - London 2012. Available at: http://webarchive.nationalarchives.gov.uk/20071105013006/http://www.london2012.com/news/media-releases/2007-12/london-2012-finishes-year-on-track.php [Accessed May 24, 2013]. Olympic Park Legacy Company. Creating the Queen Elizabeth Olympic Park: Post-Games Transformation. Available at: http://dl.dropboxusercontent.com/u/6135065/Legacy%20Company%20website/Transformation%20brochure%20%28Jan%202012%29.pdf [Accessed May 22, 2013]. Owens, M. (2012). The impact of the London Olympics on the Lower Lea: regeneration lost and found?. Australian Planner 49(3): 215–225. Pearson, M.P. et al. (2006). Materializing Stonehenge. The Stonehenge Riverside Project and New Discoveries. Journal of Material Culture 11(1–2): 227–261. Available at: http://mcu.sagepub.com/content/11/1-2/227 [Accessed May 11, 2013]. Powell, H. (2009). Olympic Sports, Spirits and Stories: Small Stories and Miniscule Myths In: Oldfield, T. and Naik, D. eds. Critical Cities: Ideas, Knowledge and Agitation from Emerging Urbanists. London: This Is Not A Gateway/Myrdle Court Press, pp. 76–87. Powell, W.R. ed. (1973). A History of the County of Essex. Available at: http://www.british-history.ac.uk/report.aspx?compid=42750 [Accessed April 29, 2013]. Price, S. (2008). Missiles in Athens and tanks at Heathrow: urban security and the materialisation of “global” threat. Social Semiotics 18(1): 1–16. Available at: http://www.tandfonline.com/doi/abs/10.1080/10350330701838845 [Accessed April 17, 2013]. Prost, J.-F. (). adaptive actions. Available at: http://www.adaptiveactions.net/action/41/ [Accessed May 10, 2013]. Richardson, V. (2012). Point of View: The London Olympics’ First Public Viewing Platform In: Marrero-Guillamon, I. and Powell, H. eds. The Art of Dissent: Adventures in London’s Olympic State. London: Marshgate Press, pp. 68–71. Samatas, M. (2007). Security and Surveillance in the Athens 2004 Olympics Some Lessons From a Troubled Story. International Criminal Justice Review 17(3): 220–238. Available at: http://icj.sagepub.com/content/17/3/220 [Accessed May 27, 2013]. Schofield, J. and Cocroft, W. (2011). Hohenschönhausen: Visual and Material Representations of a Cold War Prison Landscape In: Moshenska, G. and Myers, A. eds. Archaeologies of Internment. New York and Dordrecht: Springer, pp. 245–261. One World Archaeology. Schuppli, S. (2012). A memorial in exile in London’s Olympics: orbits of responsibility. opendemocracy.net, Available at: http://www.opendemocracy.net/susan-schuppli/memorial-in-exile-in-london%E2%80%99s-olympics-orbits-of-responsibility [Accessed May 22, 2013]. Sinclair, I. (2009). Hackney, That Rose-Red Empire: A Confidential Report. London: Hamish Hamilton. Sinclair, I. (2008). The Olympics Scam. London Review of Books, : 17–23. Available at: http://www.lrb.co.uk/v30/n12/iain-sinclair/the-olympics-scam [Accessed January 8, 2013]. Sorkin, M. (1992). See You in Disneyland In: Sorkin, M. ed. Variations on a Theme Park: The New American city and the End of Public Space. New York: Hill and Wang, pp. 205–232. The Motorway Archive. A102(M) Hackney Link. Available at: http://www.ciht.org.uk/motorway/a102mhackney.htm [Accessed April 30, 2013]. Tomlinson, S. (2012). Centring on the Olympic Fringe. Architectural Design 82(1): 102–107. Available at: http://onlinelibrary.wiley.com/doi/10.1002/ad.1358/abstract [Accessed April 15, 2013]. Toohey, K. and Taylor, T. (2012). Surveillance and securitization: A forgotten Sydney Olympic legacy. International Review for the Sociology of Sport 47(3): 324–337. Available at: http://irs.sagepub.com/content/47/3/324 [Accessed April 19, 2013]. Upson, A., Barber, K. and Powell, A. (2012). Chapter 6: From farmland to factories, 1860–1960: a century of industrial development In: By river fields and factories: the making of the Lower Lea valley: archaeological and cultural heritage investigations on the site of the London 2012 Olympic and Paralympic Games. Salisbury: Wessex Archaeology, pp. 153–221. Wainwright, O. (2011). London 2012 Olympic stadium by Populous. Building Design, Available at: http://www.bdonline.co.uk/buildings/london-2012-olympic-stadium-by-populous/5016249.article [Accessed May 21, 2013]. Weizman, E. (2011). The Least of All Possible Evils: Humanitarian Violence from Arendt to Gaza. London and New York: Verso. Wells, M. (2010). London 2012: A Rubbish Olympics…. Games Monitor, Available at: http://www.gamesmonitor.org.uk/node/1108 [Accessed May 11, 2013]. Zaun, L. (2012). Zaun Fencing Systems: The Future of Fencing. 3.1th ed. Available at: http://www.zaun.co.uk/uploads/file/Brochure/Zaun_Brochure_23_12_09.pdf [Accessed January 8, 2013].